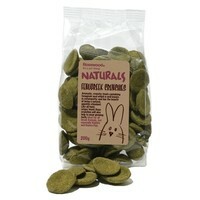 Rosewood Naturals Fenugreek Crunchies are healthy yet delicious treats for rabbits and rodents. These aromatic, crunchy treats are completely natural and will also help to wear down your animal's growing teeth. Only high quality ingredients are used to make these irresistible treats which means that you can be sure they will taste great and be thoroughly enjoyed by your pet. Brilliant products our rescue bunnies love them !!! My 2 bunnies get exited with the Fenugreek treats . They absolutely love them and jump around like baby lambs to me to get some . I always buy Fenugreek as they are a healthy treat . I always keep a pack of these in the house for my bunnies. They go crazy for them! You can break them up and use them for training. Mine will do tricks to get one of these fenugreek crunchies. A great treat to give alongside a good high fibre diet of hay and grass plus a small amount of pellets and greens. If your bunny doesn't like the smell of them at first keep trying as they will most likely love them when used to them. My bunnies climb over each other to be first to get their treat! They just can't get them quick enough. Really really popular with the bunnies, one of their favourite treats. A good price too. I have no idea what it is about these that is just so good, but my bunnies go daft for them. They love them. I will be back ordering more really soon.